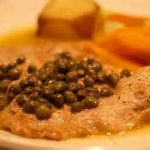 This veal piccata with orange, capers and tarragon recipe has been altered with ingredients that are decidedly non-Italian but are unique and flavorful.Note: You can change the number of people served by placing your cursor over "Servings". The Ingredients will adjust to the new number of servings. Season the veal with salt and pepper and coat lightly with flour. In a large non-reactive skillet, melt 1 tablespoon of the butter in 1 teaspoon of the oil over high heat. Add half of the veal in a single layer and cook about 2 minute per side. Transfer the veal to a large serving platter and keep warm. Repeat with 1 more tablespoon each of the butter and oil and the remaining veal. Add the orange juice, orange zest, capers and vinegar to the skillet and bring to a boil over high heat. Cook, stirring until slightly thickened. Add the remaining 2 tablespoons of butter and the tarragon and whisk until blended. Add up to 2 tablespoons of water if the sauce looks thick. Return the veal to the pan and turn each piece to coat with sauce. Transfer the veal to a large serving platter, pour the sauce on top and serve.